Today I would be leaving Thailand for Cambodia. I have immensely enjoyed my time in Phuket and it was all that I hoped for it to be. I am curious to see if visiting Angkor also lives up to my high expectations! This morning I had to get up early. Unfortunately, I slept a little late and hadn’t packed from the night before. The reception desk was slow, and it took me 25 minutes to get a taxi. I ended up arriving too late at the airport as the ticket agents for my 7 a.m. Bangkok Airways flight from Phuket to Bangkok had already left the check-in desk for the gate. I grabbed some breakfast and talked to a couple of British girls while I awaited for the agents to return. I had to pay a small change fee and was ticketed on the next flight to Bangkok. After going through the terminal and arriving at the gate, I saw some of my South African and American friends from my tour the day before. We talked on the shuttle bus ride over to our plane, and it turned out they did not go out the night before. After saying adieu, we boarded the plane and headed towards Bangkok. Upon arrival at Bangkok’s airport, I visited a few shops and grabbed some Pad Thai at a restaurant. Then I boarded my Bangkok Airways flight to Siem Reap departing around 14:00 p.m. As we left the sprawl of Bangkok, we flew over endless rice paddies before I started to see Angkor’s ruins below. 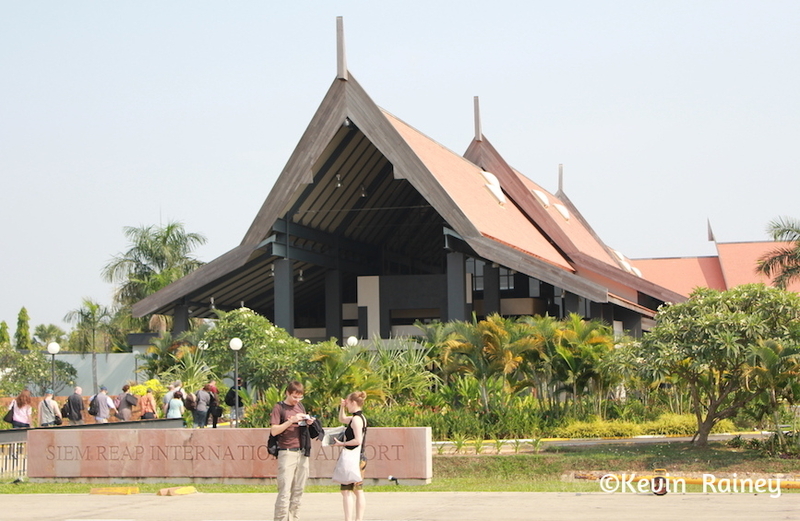 Around 15:00 p.m. we landed in Cambodia. At the Siem Reap airport, I filled out my landing card before having my photo taken and paying $20 for my Cambodian visa. After picking up my luggage, I was directed outside by the airport guides to a queue for Angkor tours. They explained to me that I could book my driver for my whole duration in Siem Reap. A taxi pulled up and my driver introduced himself as Sovonne. 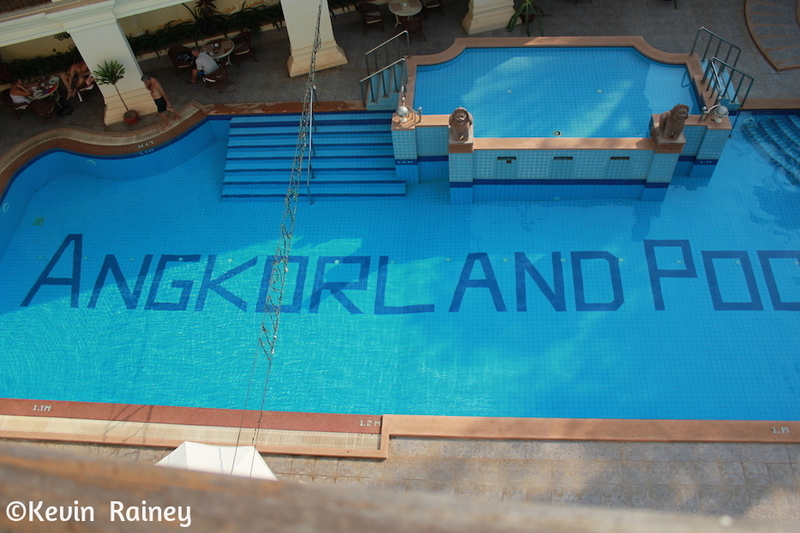 After Sovonne helped me with my bags, he drove me to my hotel: the New Angkorland Hotel, in Siem Reap. The city makes a great base for exploring the Angkor Archaeological Park which is only about four kilometers from town. However, some of the temples inside the park are as far as 3-4 kilometers apart, which means transportation is important in the humid climate. Moto-romauks (‘tuk-tuks,’) motodups (motorcycle taxis) and car taxis are the most popular forms of transportation around town and the temples. My hotel only cost me $85 for two nights. I told Savonne he could pick me up in about two hours. I checked in and found my room to be very nice. It overlooked a large courtyard with a nice pool – perfect for this hot weather! Later that afternoon, Savonne picked me up and took me to the entrance to Angkor Wat so I could get my photo taken and buy my multi-day entrance pass ($40) He said this would save a lot of time because of the morning rush. It was also good to get me into the park today after 5 p.m. We drove past the gates of Angkor Wat. You could not believe how huge this ancient city was, and I didn’t expect it to be this massive. At its height in the 15th century, Angkor Wat was by far the largest city in the world, with more than 1 million inhabitants. In fact, the capital of the Khmer civilization was the most populous city they world had ever seen until the 19th century. Savonne dropped me off in a parking lot where I was immediately hounded by kids trying to sell me books and postcards about Ankor Wat. I had been to Africa and South America – and let me assure you – this was world-class hawking! In fact, I had never had someone grab me by the arm trying to get me to buy something. I bypassed taking an elephant because they didn’t look like they were being treated well. In the evenings the elephants move from the Bayon gate and are stationed at the base of Phnom Bakheng, ready to transport passengers up the hill for sunset. 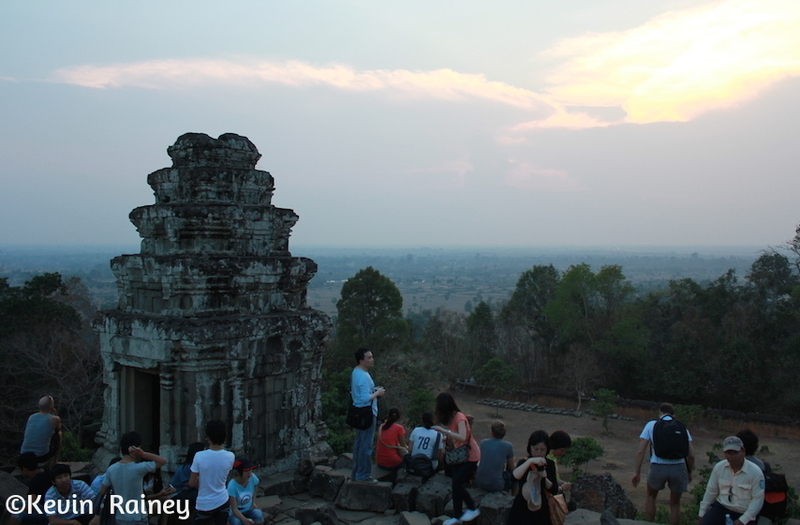 I decided to hike up Phnom Bakheng to watch the sunset. It was a pretty long hike to the top and the crowds were large. I reached some ruins of a temple at the top. 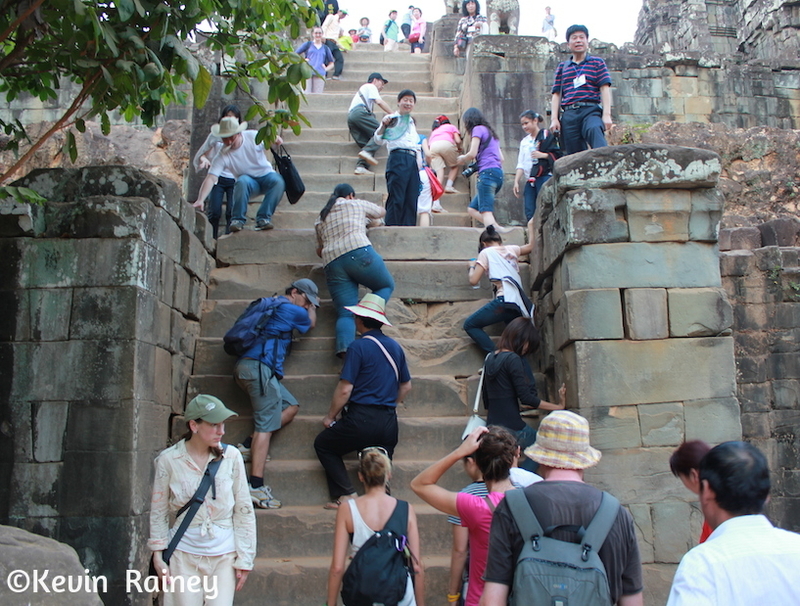 I was surprised at how steep and treacherous some of the steps on the temples were. Some were maybe five feet tall and extremely narrow at maybe 8 inches deep. You had to be very careful and hold on to the rails. They would be off limits in the U.S.! Unfortunately it was very hazy and the views of Angkor Wat were not so good. We could barely make out Angkor Wat, but it was nice to see this temple at the top. After the sunset, I hiked back down to the parking lot where a kid reminded me that I said I might buy a book on my return. I told him I would pass but they persisted. Anyway, I didn’t buy anything because they annoyed me too much. After dropping me off at my hotel to get cleaned up, Sovonne drove me to a dance hall buffet called the Sophea Angkor Pich. There was a buffet with a ton of Russian tourists enjoying a traditional Apsara dance and music show. 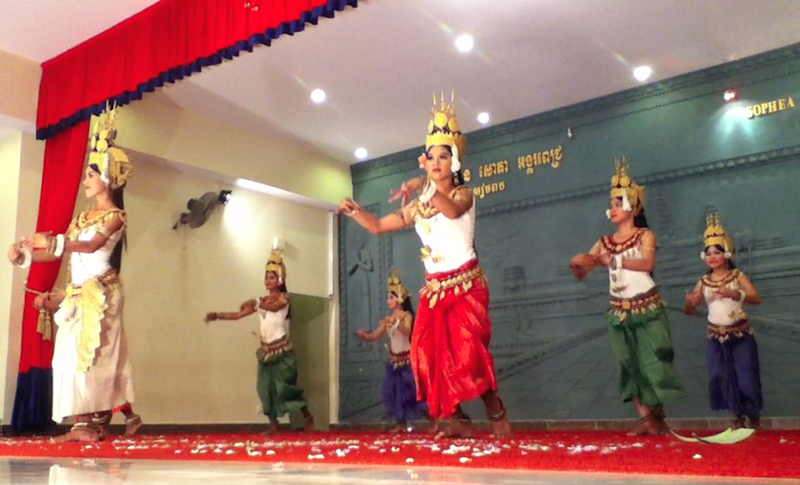 The pretty Cambodian girls wore traditional beautiful costumes and danced their way through stories of the Khmer civilization. The traditional music was almost haunting as the stories unfolded. The food was very good and included everything from noodles to fish to chicken. When the show ended, Savonne was waiting for me in the parking lot. He took me back to my hotel and we agreed that he would pick me up at 8 a.m. on Saturday for my first glimpse at the ruins of ancient Angkor.